Confident, outgoing, solid and very strong for its size, the American Staffy is a popular pet for the family who likes to include their pets in their daily activities. The breed is highly energetic and enjoys regular exercise. Although to some, American Staffys have an intimidating appearance, selective breeding has developed their temperament to be friendly and patient with children. A loyal and persistent breed, the American Staffy will courageously protect its owner if threatened and ward off any danger. 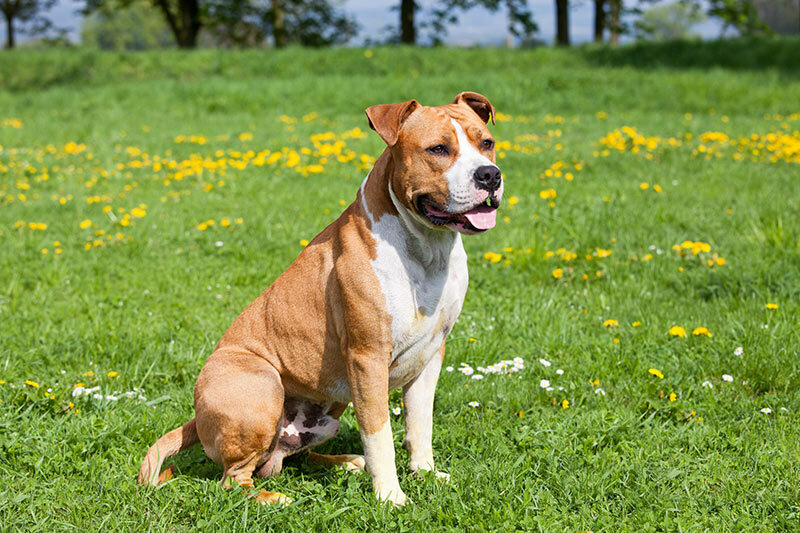 Although named the American Staffy, the breed originated in Birmingham, England and was developed from the Bulldog and a number of terrier breeds. After it was introduced to the United States, its popularity saw the breed developed into a more heavy-set and muscular animal, eventually dwarfing its English cousin. The American Staffy breeders were primarily breeding them in the States for dog fighting until the practice was made illegal in 1900. From then on the breed was developed to have a gentle temperament and became a popular show dog. While the American Staffy is a very obedient dog, their energy means that regular exercise is essential to keeping them happy and well behaved. 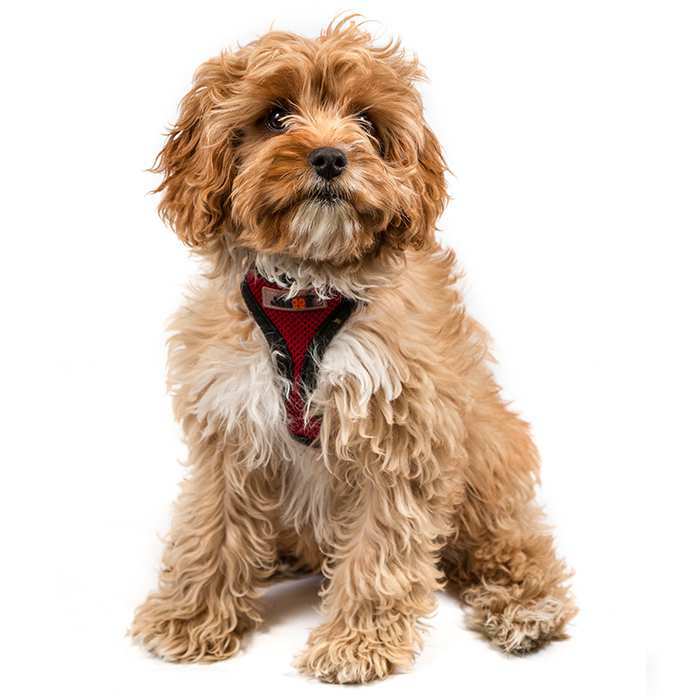 As they are very sociable dogs, needing good doses of human contact, they can suffer separation anxiety if let alone for an extended period of time.  Behavioural problems are known to occur in the breed if such anxiety manifests. 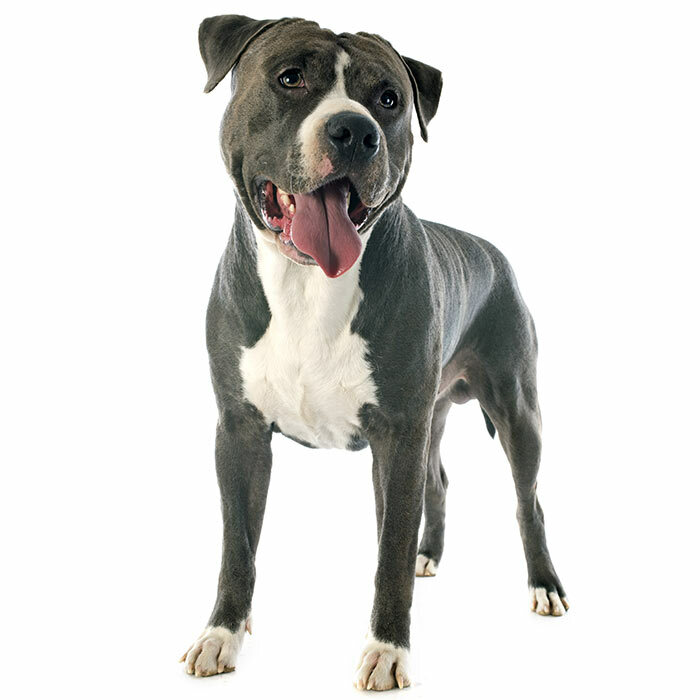 The average American Staffy weight should be between 25 and 30 kgs and will measure between 43 to 56cm in height. 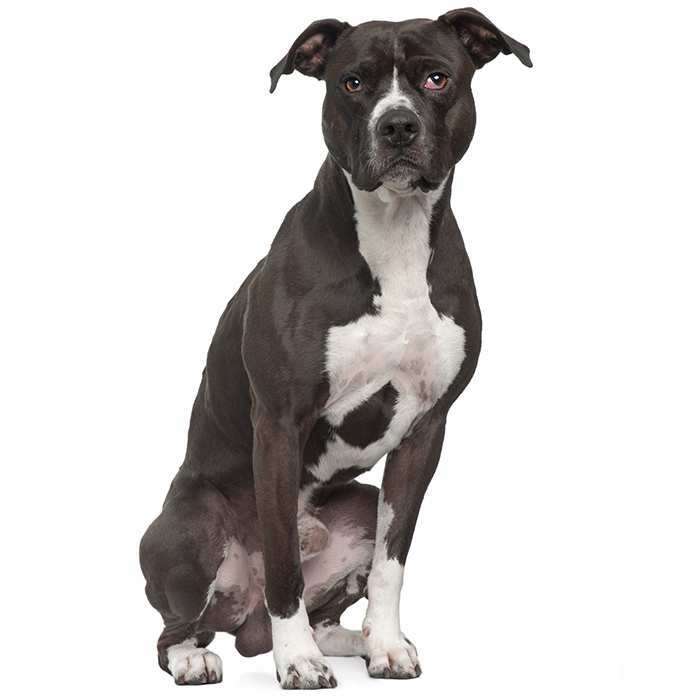 A healthy and well-exercised American Staffy will live for between 10 and 12 years of age. The American Staffy puppies come in a wide variety of colours as tan, white and other colours including the well known blue American Staffy. 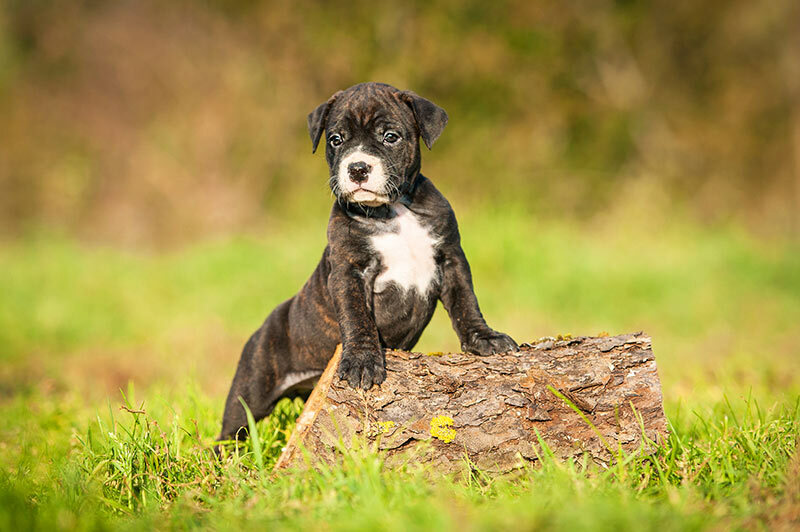 Although the American Staffy is often viewed with suspicion, American breeders have worked tirelessly since 1900 to selectively out-breed aggressiveness. The American Staffy is a notably intelligent dog; a very inquisitive and independent animal that stands firm when it feels its owner is being threatened. This loyalty translates to a great deal of affection and gentle behaviour towards children within the family. American Staffys are known to be good with children but should still be supervised during play time. This especially applies to children and adults from outside of the family. Because of its strength, tenacity and courage the American Staffy makes a good guard dog. It will protect family and property without retreat. Its high pain tolerance and aggressiveness when provoked or cornered by an attacker will result in a determined and sustained attack. Good and consistent training is a must if your American Staffy is going to behave. The breed is known to be very obedient but requires a strong pack leader with a firm hand. Humans in the family must maintain their leadership and ensure discipline is maintained. If not, behavioural problems can develop and an American Staffy can become difficult to handle. Aggression towards other dogs and pets around the house is common but early socialisation will help deter this behaviour. Introducing them to children and other animals as a puppy will help curb aggression and the earlier and more often the animal is socialised, the better. Behavioural problems may manifest if the American Staffy is left without human attention for an extended period of time.  The breed has been developed to be a good companion dog and regular human contact is essential to keeping the animal healthy and happy. Because the American Staffy is highly energetic, it’s important to walk the dog at least once daily. Discipline while walking is very important to maintaining the pack order. Make sure you assert dominance over your American Staffy by getting into good habits on the street; make the dog sit when commanded, for example and follow behind you instead of in front.  What are the most common health issues for American Staffordshire Terriers? Congenital Heart Disease. All forms of congenital heart disease occur in dogs and the American Staffy is one breed that is susceptible to the condition. Congenital heart disease is genetic and is the malformation of valves in the heart, causing serious problems that will often result in death within the first year of life. Those that have more mild forms of the condition will mostly survive but will show a tendency to avoid exercise, may have stunted growth or will occasionally faint. Cardiac arrest can occur at any time, but in most cases later in the Staffy’s life. Heart Murmurs. While heart murmurs aren’t diseases, they are common in the American Staffy and often reflective of congenital heart disease. A murmur is the sound the heart beat makes when an irregular amount of blood enters one of the heart’s chambers. Heart murmurs can be connected to endocardiosis, endocarditis, valvular stenosis or dysplasia. Many detected heart murmurs will not be severe or require any treatment. Contact your vet for a check-up if your American Staffy is showing low exercise tolerance or faints during exercise. Skin Allergies. American Staffys are prone to skin irritations and should be regularly bathed. Learn more about allergies here and other skin conditions. The heavy-set and muscular appearance of the American Staffy is the breed’s hallmark. Its stout and solid profile can be put down to the breed’s early development; having been a mix of the English Bulldog and a number of terrier breeds. It was hoped that the mix of the Bulldog and some terrier breeds would combine a great deal of strength, courage and tenacity in one animal. The result was the Staffordshire Terrier. 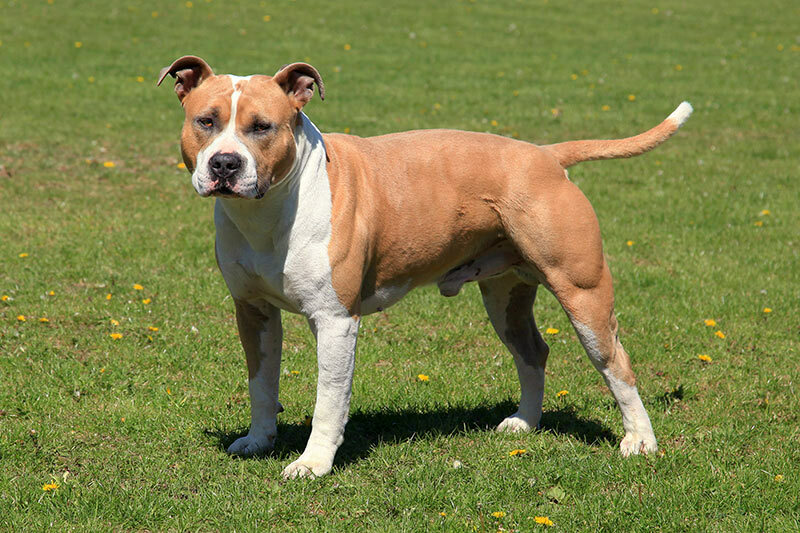 Although named the American Staffordshire Terrier, the breed originated from neither the United States nor Staffordshire in the United Kingdom. The breed was first developed in Birmingham in the midlands of England. The breed was then further developed in Staffordshire and didn’t reach the United States until some time in the 1870s. Here they found immediate popularity with pioneering families. Early in their American history the American Staffy was bred primarily as companion dogs that could be used for hunting, protection and sport. Blood sport was a common use for the breed and they were popularly chosen for use as fighting dogs for a number of years until dog fighting was banned at the turn of the century. 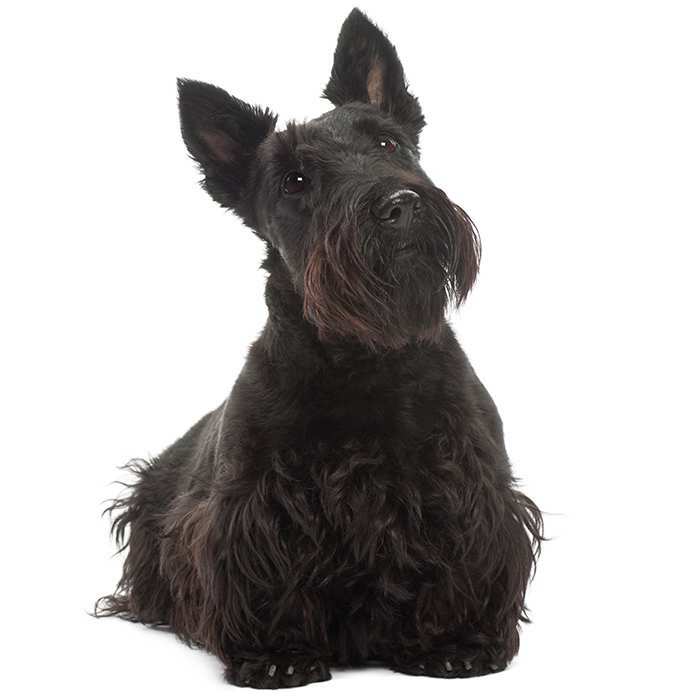 From 1900 the breed was developed to better suit a family environment and its loyalty was highly sought after by those wanting courage and tenacity to guard loved ones and property. The breed’s aggressiveness has largely been removed and the American Staffy has proven to be a loving and gentle companion. The American Staffy and Pit Bull Terrier are inherently linked. The American Staffy is recognised as a show animal and the Pit Bull is not. They were once the same breed until after dog fighting was made illegal in the United States and breeders of the American Staffy aimed to breed out the Staffy’s aggressive nature. While the American Staffy is also known as the Staffordshire Terrier, the breed’s originates from Birmingham in the United Kingdom. American Staffys and Pit Bulls have appeared in a lot of American media, especially early 20th Century advertising. Record label RCA, First World War era US Army and a prominent American shoe company to mention a few. Breeding the American Staffy for the purposes of dog fighting does continue illegally. While breeders have worked hard to remove the Staffy’s aggressiveness, some irresponsible breeders continue to soil the breed’s reputation.